Seeing the Star Wars comic book license go back to Marvel was extremely bittersweet for yours truly. Dark Horse had more than done right by everybody’s favorite galaxy far, far away. 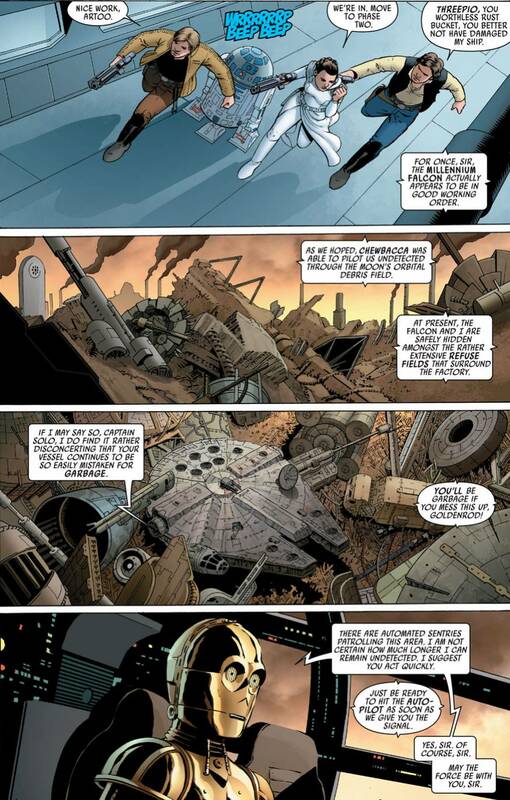 Particularly in the last year and a half or so, when Brian Wood was penning a title simply called Star Wars, something of a throwback series featuring the classic characters we all know and love. It was the same thing, in essence, that this book is doing. 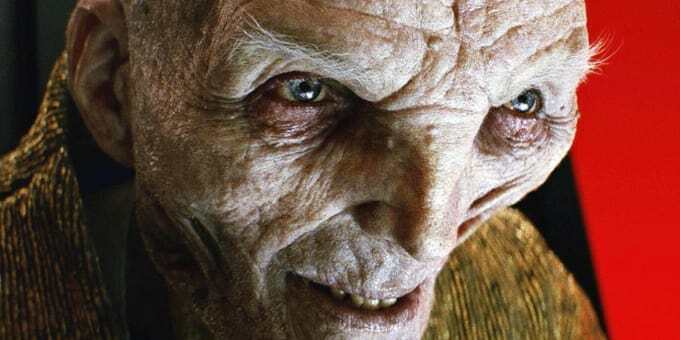 But while Marvel has no shortage of A-list creators at its disposal, and is undoubtedly capable of providing us quality books, the company’s first crack at Star Wars in the 21st century leaves something to be desired in the realm of depth and logic. 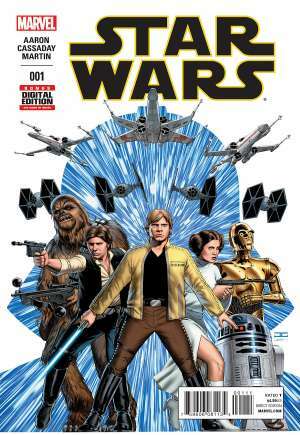 Star Wars #1 brings Luke, Han, Leia, Chewbacca, C-3PO and R2-D2 to the Empire’s largest weapons factory, with the intent to infiltrate and destroy. But little to they know that Darth Vader himself is very near, and he’ll soon come face-to-face with the young rebel who destroyed the Death Star…. On paper, it’s a simple but effective way to kick off a Star Wars series. Stick all your main characters in the middle of an Imperial hotspot, and have them fight their way out. Just like they did on the Death Star, just like the did at Cloud City, just like they did on Endor, etc. 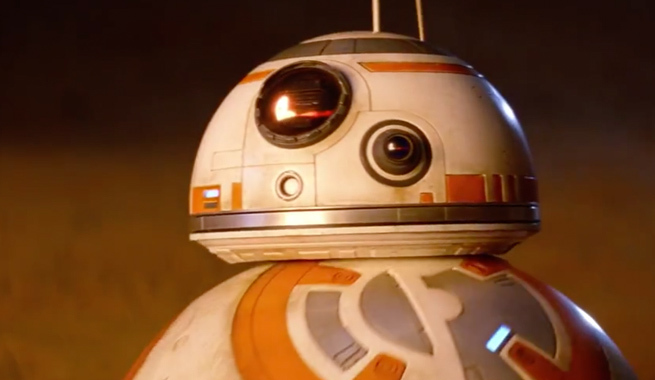 Using this formula definitely helps capture the classic Star Wars feel they’re looking for. Another crucial element in this respect is the issue’s four-page replication of the Star Wars opening title crawl. 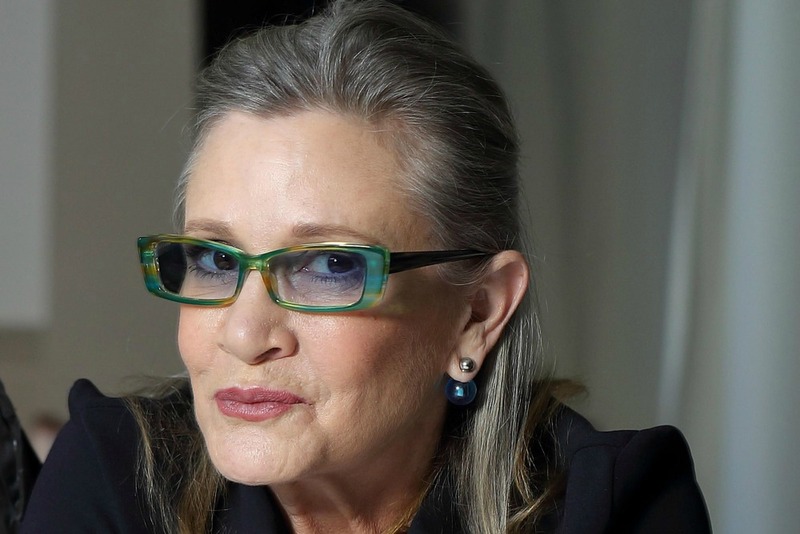 We’ve got a page dedicated entirely to “A long time ago in a galaxy far, far away,” a two-page spread of the big Star Wars flash, and on the fourth page the issue gets its own title crawl. 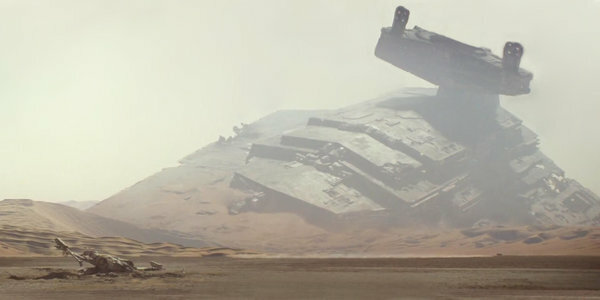 Then, in typical Star Wars movie fashion, we go to empty space, and a ship flies into frame. If you’re a Star Wars geek, they’ve easily got you at this point. 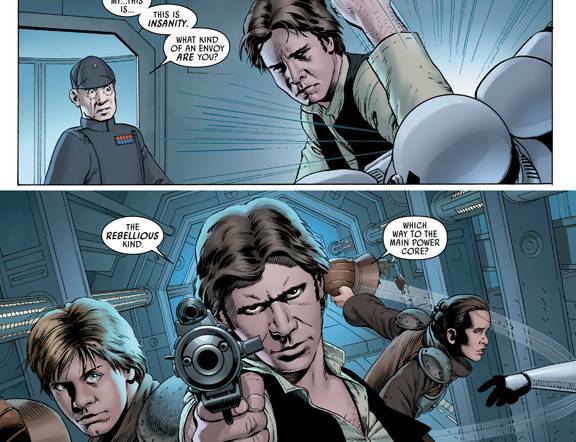 And low and behold the first hero we see is Han Solo, doing his witty Han Solo stuff! But the biggest selling point of this issue by far is seeing John Cassaday draw Star Wars stuff. I once read his artistic style described as “instantly iconic,” and that’s certainly the case here. He’s got a great handle on the likenesses of ‘70s Harrison Ford and Carrie Fisher. His Mark Hamill isn’t perfect, but that’s forgivable. 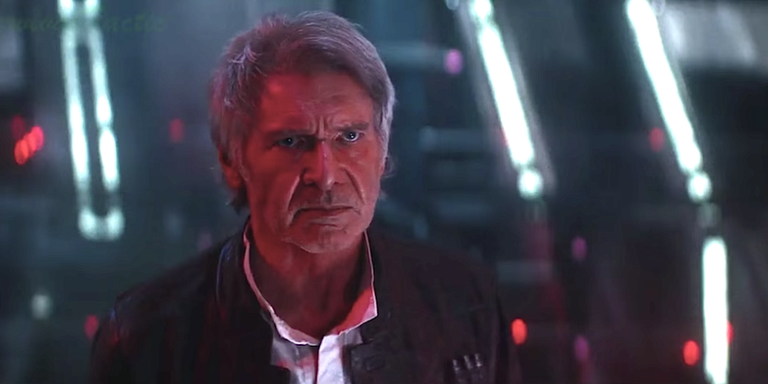 Hell, the man’s face literally changed between A New Hope and The Empire Strikes Back. And unlike other artists who’ve done these characters, Cassaday’s take on the Darth Vader death mask and C-3PO’s ever-distinguishable headcover remain frozen and consistent throughout the issue. Elements from all three classic films are incorporated into this issue, and if I were a betting man, I’d say Cassaday had fun with this one. All this said, this issue lacks a lot of the depth and heart that made Brian Wood’s stuff so good. It relies on spectacle over substance. Case in point, Luke’s use of the lightsaber. Yes, we all love lightsabers, but I’m a firm subscriber to the Harry S. Plinkett philosophy on their overuse, and how they can sometimes be a sign of lazy or bad writing. 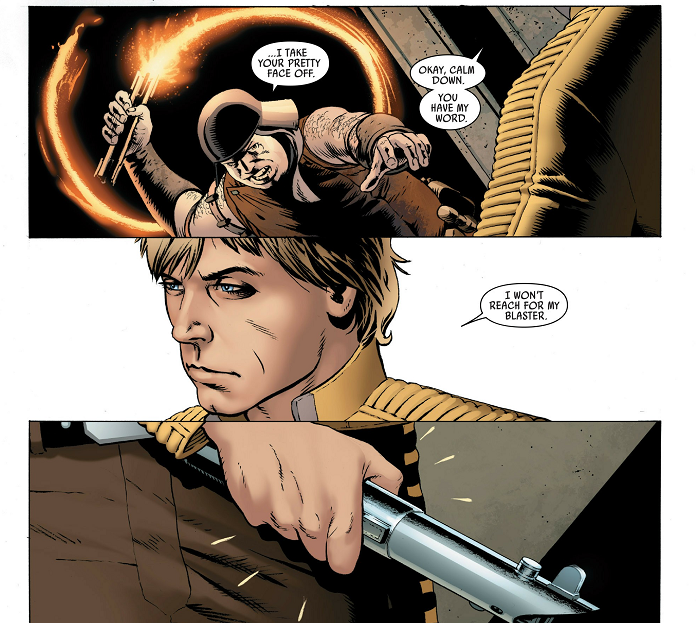 In Star Wars #1 we see Luke use the lightsaber to fight off a guy with a laser-whip weapon. Shortly after cheaply paraphrasing a line from A New Hope, an off-panel fight ensues, during which all we see is the lightsaber swinging for two panels. A splash page of Luke soon follows, the ignited weapon in his hand. We also see Vader use his lightsaber later, though only for an instant. 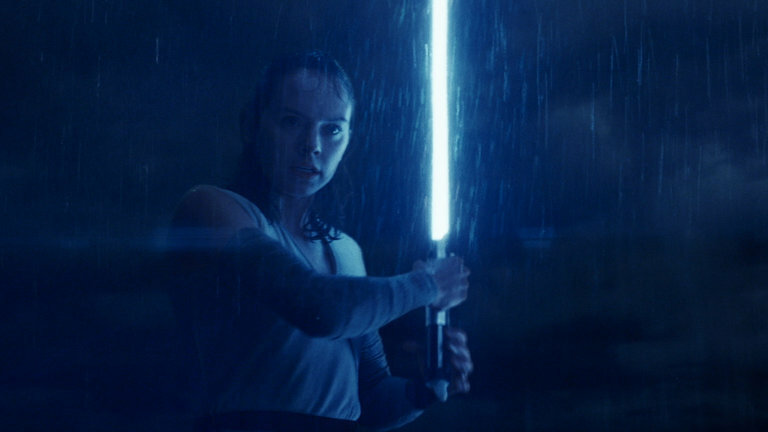 This is where I get a bit nitpicky: How proficient was Luke with the lightsaber at this point? It’s heavily implied that this issue takes place shortly after the Death Star was destroyed. 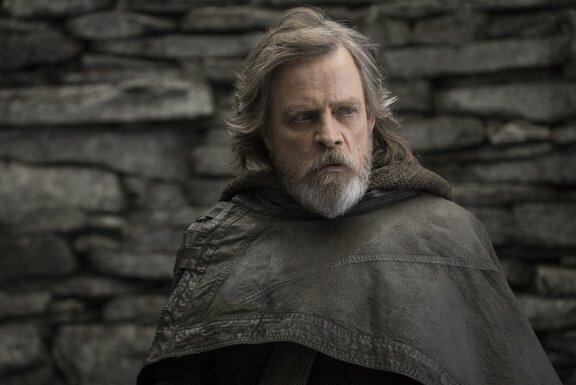 So Luke’s knowledge about his heritage and the Jedi ways, much less this new weapon (which he didn’t even use in A New Hope) are still rather limited. And yet he’s able to dispose of this guard pretty quickly. My proposed solution? Give us a little more action by extending this scene a page. Have this guard with the whip get the better of Luke at first. But in the end, he perseveres and wins. This gives our young hero a small victory, and we also get a sense that he’s grown a bit in experience, but is still nowhere near where he wants to be. Also, why is Leia even on this mission? Why is one of the Rebellions’ top leaders being sent into the middle of enemy territory? 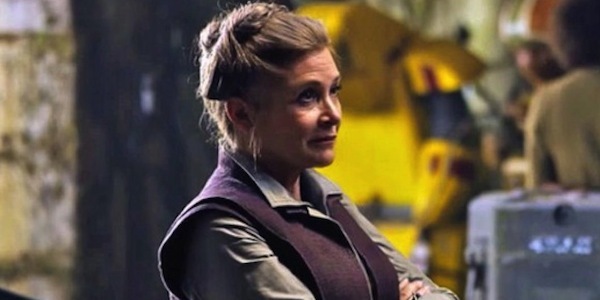 Hell, they don’t even keep her in the Millennium Falcon with Threepio. She’s directly in the line of fire. From a creative standpoint, it’s obviously so we can have our three main heroes together. But logistically, it makes no sense. 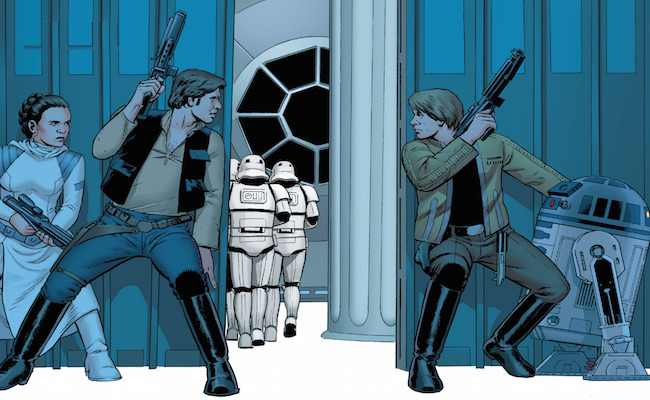 At the very least, Star Wars #1 is pretty. But it’s also frustrating. Look, we all love that classic Star Wars stuff. 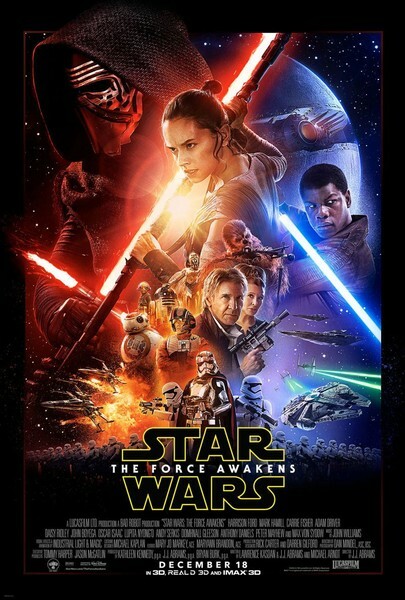 Darth Vader, lightsabers, the big title crawl, etc. But imagery from the classic trilogy can’t be the only thing your issue has going for it, or it’ll fall flat. Especially considering this is the first Star Wars issue Marvel has published in decades! C’mon, guys. You can do better than this. Image 1 from popmatters.com. Image 2 from littlestuffedbull.com. Image 3 from blacknerdproblems.com. Image 4 from starwars.com. This entry was posted in Comic Books/Graphic Novels and tagged Brian Wood, C-3PO, Carrie Fisher, comic book reviews, comic books, Dark Horse Comics, Darth Vader, Han Solo, Harrison Ford, Jason Aaron, John Cassaday, lightsaber, Luke Skywalker, Mark Hamill, Marvel, Millennium Falcon, Princess Leia, Rob Siebert, single issue reviews, Star Wars, Star Wars #1 (2015), Star Wars Trilogy, Star Wars: Episode IV - A New Hope, Star Wars: Episode V - The Empire Strikes Back on 01/14/2015 by primaryignition.